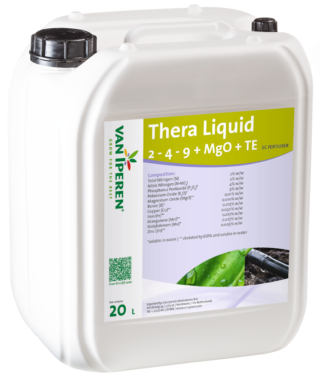 Van Iperen Thera Liquid | 2 - 4 - 9 + MgO + TE is a pure and concentrated liquid NPK with a high level of Phosphate combined with EDTA chelated Micronutrients. Our product is a transparent, stable solution and is recommended during fruit or tuber development, especially during periods of drought. The high level of Potassium in our formula improves the cell pressure and regulates the functioning of stomata. The presence of Magnesium and Micronutrients contributes to the production of chlorophyll and supports general plant metabolism. Produced in our own plant Euroliquids. 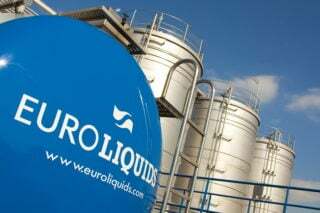 Our sister company Euroliquids, conveniently located in the port of Rotterdam, is the largest liquid fertilizer factory in Northern Europe. This is where we produce our high quality liquid fertilizers and work on developing innovative new recipes.